My best friend would warn you: - “Don’t get her started on diet tips.” Too late now, the keyboard is warming up. Anyone who has ever gone on a diet knows how difficult it can be to stick to the rules and achieve those weight loss goals. Losing weight is about being informed (knowing what you’re eating), being active and being patient (not jumping on the scale every 2 hours). But adjusting your diet and sticking to that health eating plan can be so difficult, especially in the beginning. Extra diet motivation in the form of handy diet tips and tricks is helpful but I bet you’ve heard them all before. By now they are boring and monotonous although still valid if you follow them. I’ll remind you of the obvious dieting tips and then give you a few slightly more quirky ones that might not work for everyone but are worth a try. So here is a list of diet tips that will help to keep you on the right track for losing weight and show you how to stay on your eating plan. Be honest with yourself about your weight loss goals. If you want to lose 20lbs in 2 months, the chances are you’ll probably quickly become disheartened at your relatively slow process and just fall off your diet after a couple of weeks. A more realistic approach is to aim to lose between 5-10% of your body weight over a suitable period of time. Another good reason for slow and steady weight loss is that the weight is more likely to stay off if it’s been dropped over a longer period of time. If your goals are more achievable, you will feel more empowered, happier and more inclined to stay on your diet so start slowly and see how you go – and give yourself a big pat on the back every time another pound disappears. If you’re suddenly depriving yourself of all the things you normally indulge in, your body is going to crave some of those things and you need to be prepared to deal with those cravings. First of all, acknowledge the craving but then quickly distract yourself with another task. Cravings come and go and if you can just keep busy and ride them out, you’ll quickly feel more in control and that’ll give you an extra boost. Although you may think you need to avoid food as much as possible, it’s far better for your digestive system to eat small, nutritious, regular meals. This also helps you to recognise when you are genuinely hungry rather than just craving foods. A healthy breakfast especially is proven to help with weight loss. If you’re an incentives kind of person then to achieve your weight loss goals, you’re going to have to make it worth your while! So why not set yourself little targets and then when you hit them, result in you getting a little treat (not a food treat). Perhaps you could treat yourself to a new outfit (with all the money you’ve saved not eating fast food!) or a new hairstyle or a spa treatment like a massage or manicure/pedicure or facial. Giving yourself these little rewards can help keep you on track. Yes you knew it would creep in there somewhere amongst the diet tips! Exercise and increased activity is a great friend to weight loss. Cutting down on excess empty calories is pretty effective but if you want to speed up your weight loss, getting out and about and getting your heart rate up is a sure fire way to boost your achievements. Just walking is enough to get your heart going so instead of driving to the local shop, why not take a brisk walk instead? The fresh air will do you good and disctract you from snacking. Healthy eating can be way more fun if you’re skilled in making your own tasty dishes. Another benefit to cooking your own meals from scratch is that you’re in complete control of calories. You can substitute ingredients for low calorie versions. Why not invest in a low-fat cookbook? It’ll give you plenty of ideas and tips for how to prepare tasty, healthy meals. Sorry, we don’t mean wine (although it does have some health benefits)! You need to make sure you are drinking at least 6 glasses of water every day – more if you’re doing exercise and depending on your climate. Make sure your urine stays a nice light colour. Dark urine suggests mild dehydration and that won’t help with your weight loss. Drinking water when you feel a mental urge to snack can help you feel fuller and avoids the confusion between thirst and hunger. Keep tabs on what you eat by having a food journal. Record everything you eat. People who keep food journals generally lose more weight than those don’t. Use a smaller plate for your main meal. Eat an egg for breakfast. It apparently helps curb hunger and results in few calories being eaten for the remainder of the day. If you eat sandwiches for lunch most days then try having open sandwiches. That way you save the calories of a slice of bread. Over a month, that works out to 30 slices of bread! Chew for longer - at least 30 times before you swallow it. This is an important diet tip and also a great remedy for indigestion as well as helpful for keeping candida in check. Quite possibly your jaw will be so tired after a meal that you won’t feel like eating for a while. If you're craving an unhealthy treat then brush your teeth. It seems to work for some people to help them last until the next meal time. My personal favourite of the diet tips: find a photo of a beautiful body that you are trying to achieve and stick it on the fridge or in your office or anywhere that it'll be in your daily sight. Try to form a mental image of yourself as you wish to be. Some people find the mental image good enough motivation to stick to the healthy diet. There are countless faddy diets out there that will work temporarily but see you pile the pounds back on the minute you stumble. 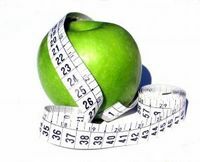 The key is approaching weight loss healthily and realistically to keep you healthy in mind, body and soul. If you have any helpful diet tips that you'd like to share then please do so here.